The Armenian Community of Calcutta, except a very few, were all descendants of the Armenians of Julfa, now in Iran. The first group of Armenians, who settled in India, was mostly rich merchants and traders, and they intended to reestablish themselves as a separate socio-cultural identity. They constructed alms houses, chapels and schools for the benefit the local Armenians. There are two Armenian Chapels in Calcutta. St. Mary’s Chapel is situated in the Tangra area of east Calcutta, and the chapel of St. Gregory, also known to the local Armenians as the ‘small church’, is situated in the Park Circus area of Calcutta. 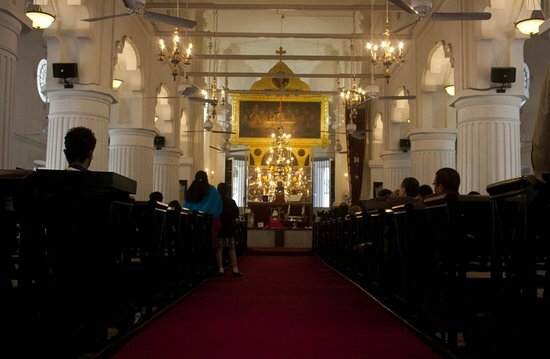 But the Armenian Holy Church of Nazareth, situated at no 2, Armenian Street, in the northwestern corner of Burrabaza, is regarded as the oldest Church in Calcutta. The Armenian Holy Church of Nazareth is actually, considered to be the Mother Church of the Indian Armenians. However, the first Armenian Church, St. John’s Church, was built by the contribution of the people on June 22, 1688. Unfortunately, that church was completely destroyed by a devastating fire in 1707. Seventeen years later, in 1724, The Holy Church of Nazareth was built on the old burial ground of the Armenian community by Agha Nazar, and hence it was named after him. The architect, Mr. Levon Ghevond, was an Armenian from Iran. The belfry and the steeple were added ten years later in 1734 by Manuel Hazarmall. In 1789, Agha Catchik Arakiel presented an English clock to the church which he had ordered from the firm of Alexander Hare of London. The clock arrived in Calcutta in 1792 and was fixed in the clock tower. The interior of the church, designed by Catchick Arakie, is decorated with a combination of black and white marble. A staircase leads to the upper floor galleries adorned with inset frescos and rich paintings. The altar is crowned with a cross and decorated with three paintings. The said paintings, ‘Holy Trinity’, ‘Last Supper and ‘The Enshrouding of Our Lord’, are works of an English artist, A.E.Harris. It is said that the Church was built over an Armenian Graveyard and it is also surrounded by a graveyard. 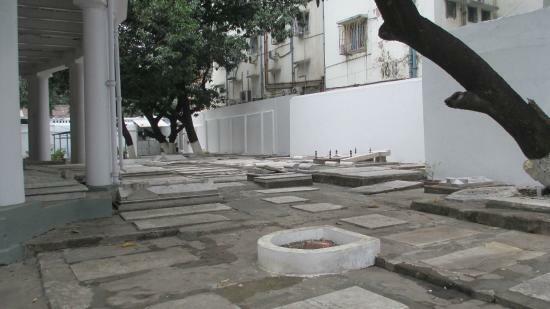 The remains of an Armenian-Persian type bath (Hamam) is still there, on the east side of the Churchyard. In the churchyard, there is also a little memorial, known as the Armenian Genocide Memorial. 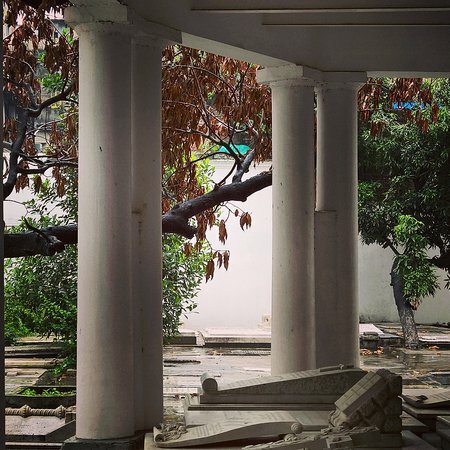 It was built by the Armenian community of Calcutta on 24 April 1965, to mark the 50th anniversary of the great national tragedy, the genocide of the Armenians, when about 1.5 million innocent Armenians were brutally massacred by the Ottoman Turks during and after the Great World War 1914-1918.